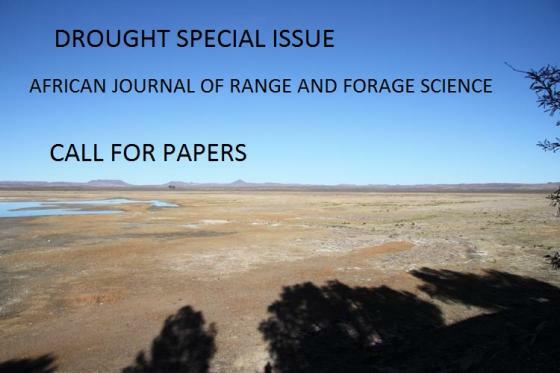 General call to submit a manuscript for the Drought Special Issue of the African Journal of Range and Forage Science. The African Journal of Range & Forage Science is a leading rangeland and pastoral journal in Africa. The Journal is dedicated to publishing quality original material that advances rangeland ecology and pasture management. The Journal will be producing a Special Issue with a focus on Drought, due for release at the beginning of 2020. The emphasis will be on the effects of drought in grassland and savanna areas that receive summer rainfall, though studies from adjacent areas will be considered. The main themes of the issue are the climatology of drought, and its influences on plant and animal ecology, economics, social systems, natural history, and fire dynamics. Manuscripts will be procured through both personal invitation and an open call for submissions.